After a series of high fevers and a swollen stomach, doctors had performed an ultrasound that revealed a mass on Greta’s liver. It was cancer. After a surgery to remove 70% of her liver and many rounds of chemotherapy, Greta received the good news that she was in remission in March of 2016. That happiness was short-lived, however, as scans just five months later revealed that the cancer had returned . She would need a liver transplant to save her life, but that wasn’t going to be possible in her home country of Canada. 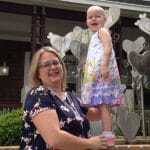 After joining a support group for patients like Greta, Lindsey learned of a doctor at Cincinnati Children’s who was working wonders for kids battling liver cancer. After a few phone calls, the family learned that their daughter would be able to receive a liver transplant in Cincinnati, but they would need to be within five hours of the city in order to make that happen. From their home in Calgary, every moment would count. While some families must wait for months for that fateful phone call, Greta was lucky. Just six days after being placed on the list for a transplant, Lindsey received a call that there was a liver that was too good of a match to pass up. Within 24 hours, Greta had a new liver. Shortly after that, Lindsey got another phone call with good news: there was a room ready for their family at Cincinnati’s Ronald McDonald House. Greta returned home to Calgary in August 2017. Her cancer is very aggressive and treatments are now experimental. But she continues to fight and find joy wherever she can. While at the House, one of her favorite things to do was to help in our garden. One of our amazing volunteers, Linda, spent all summer redoing many of our planting beds and Greta was beside her much of the day. If you come to our House, you have Greta to thank for many of the beautiful pink flowers that now decorate our landscape. Since returning home, Greta has asked that we keep sending her pictures of the garden because it brings her so much joy. When they were far from home and in a different country, Lindsey, Greta and her family didn’t feel alone in our House. Even though our city is not their home, they felt supported and safe.